On occasion during a fireplace inspection a chimney sweep may discovery that one or more of the liners in the chimney are cracked or broken which renders the fireplace unusable until repaired. Relining the chimney is one relatively quick way to solve the problem. 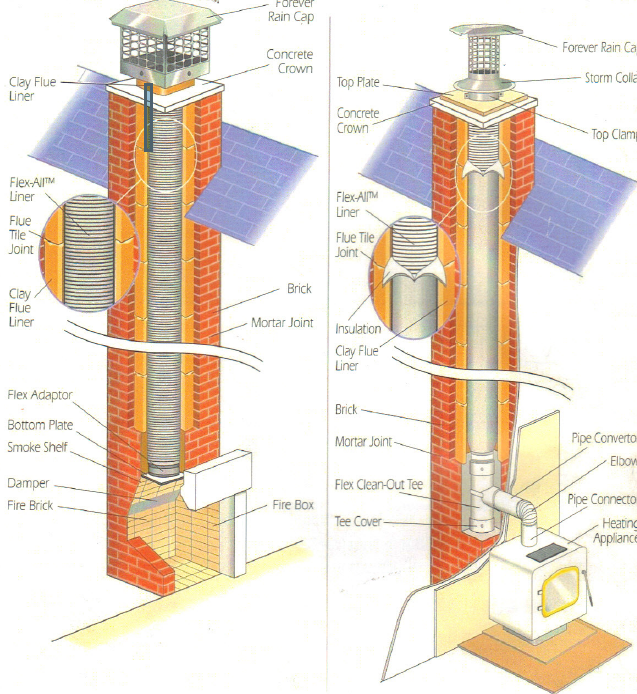 Relining is also a good solution for unlined chimneys (many early chimneys were built without liners). Unlined chimneys are more difficult to locate cracks, gaps, etc. and it is recommended that unlined chimneys be lined to make them safer. The diagram shows how the relining is accomplished. A flexible metal tube specially designed for the proper fuel burning application, is inserted into the chimney and secured, effectively replacing the broken or cracked liners and ensuring safe burning in the system. This process takes approximately one to two days. There are several different types of relining processes and materials, all of which have their merits. However, Smokey Joe’s, after extensive research and evaluation, has chosen to install the flexible metal 316Ti all fuel lining material because we feel it is the strongest, most reliable and cost effective solution for our customers. Our greatest concern being that we are located in an earthquake prone area and other types of liner materials may crack again during a moderate earthquake, resulting in additional expense to our customers. It is our opinion that the metal liners offer the best protection in the event of a mild to moderate earthquake at a more reasonable cost to our customers as well as offering a lifetime guarantee on the materials.